A spiralling contraption hangs on the ceiling of the Danmarks Tekniske Museum in Helsingør. It has a tiny motor, a simple frame, and small wheels. Above the motor, a whirl of small wings are attached at intervals around the wide diameter of two thin, round frames with crisscrossing spokes, like a bicycle wheel turned on its side. This is Jacob Ellehammer’s helicopter designed in 1912, and lovingly reassembled by a team of retirees after it was discovered in pieces in 2005. Ellehammer was born in a small town in the south of Zealand in 1871. Originally educated as a watchmaker, he was a talented inventor and mechanic, best known for his test flights in the early years of aviation, from 1906-1910. He first succeeded in a test flight on the island of Lindholm on 12 September 1906. He took off in his invention, which was essentially a motorised kite, and flew 42 metres at a height of half a metre. Nervø laid on his back, taking pictures the whole time, and the four men were thrilled by the success. Ellehammer was motivated to continue his experiments with new models and designs. In 1909 he built and patented an aircraft with wings that could be folded for transport and unfolded before flight. However, after this plane lost a race over Øresund in the summer of 1910, his interest shifted to helicopters. Over the course of 1911 he developed a machine that handled these problems and then put it to the test in 1912. Ellehammer worked together with a weapons producer as a sponsor, and held successful trials of the helicopter inside enclosed spaces. He created a stabilising system by allowing the rotor blades of the helicopter to be adjusted, and the machine carried one passenger up in the air on its third trial. In 1913, French military officials were invited to see the helicopter, and Ellehammer was hopeful they would place an order for several. Unfortunately, one of the mooring lines broke as the machine was going up, and it keeled over on its nose. After this disappointment, Ellehammer stuck to experimenting with scale models. The helicopter did not become a reality until 1939, when Russian immigrant Igor Sikorsky constructed a working model in the United States. Ellehammer filed 60 patents over the course of his life, as well as numerous patents abroad. Sometimes he filed the same device in 15 or 16 countries for copyright protection. He constructed devices for X-rays, machines for dispensing liquids automatically, and steam-driven tractors. He often considered the various world markets for his inventions, and even travelled to Egypt in 1913 to promote a newly-developed cigarette machine. Before getting into the dream of flying, Ellehammer developed a simpler version of a motorcycle, dealing with the problems of creating a smoother ride and how to shape the frame. Afterwards he tried to market his automobile design, called the Ellemobil. 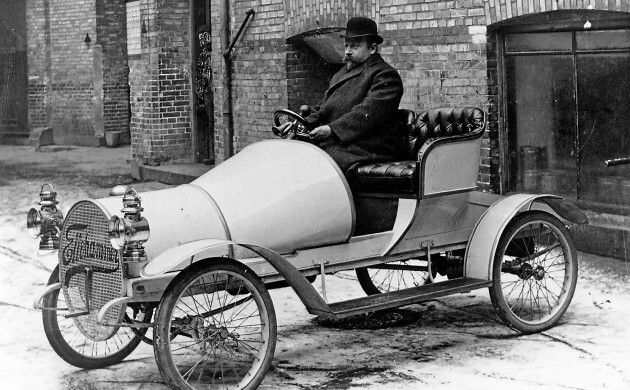 This tiny car was constructed in 1910 as a way to sell cars cheaply. Though a factory deal never actually materialised, Ellehammer did succeed in inventing a hydraulic clutch. Many inventors are said to be ahead of their time. While Ellehammer never produced the machine he was aiming for, his developments in steering, hydraulics, and his independent work using steam and water power, inspired the public to think big. Danmarks Tekniske Museum has set up a permanent exhibition honouring Ellehammer’s work. The best parts of their collection are the films and photographs of his endeavours, some of which are available on their website. Two of the flight tests are captured in short clips, where elegant men wearing long black coats and bushy mostaches stand around watching Ellehammer bring out his plane. He is slightly rotund and has bulky clothes on, and the men wait and watch, milling about because nothing is happening yet. The crowd does not look impatient. These men are staring at the plane in the same way that office workers today stare at large machines at construction sites on their lunch breaks. The mix of pretend expertise, envy and carefully concealed admiration is also there as Ellehammer moves down the runway.